The Week chooses Essential Pleasures as "The Book of The Week"
A vibrant anthology and accompanying CD that revive a great American tradition: the joy of reciting poetry aloud. This lively, abundant book is distinguished by its focus on hearing poetry read aloud. Robert Pinsky, beloved for his ability to bring poetry to life as spoken language, has collected poems that sound marvelous in a reader’s actual or imagined voice. Pinsky has organized the book into sections with brief introductions that emphasize the attentive, intuitive, and reflective process of listening to poetry. 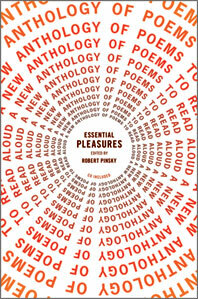 This structure provides an implicit, generous definition-by-example of poetry itself: beginning with “Short Lines, Frequent Rhymes” and “Long Lines” and proceeding through fundamental themes such as “Love Poems,” “Odes, Complaints, and Celebrations,” and “Jokes, Ripostes, Parodies, and Insults.”Essential Pleasures gives a fresh setting to traditional favorites, including poems by William Shakespeare, Emily Dickinson, and Robert Frost, placed among contemporary poems by John Ashbery, Louise Glu¨ck, Yusef Komunyakaa, and many others. This is an inviting and distinguished collection and an essential book for every home.